Product prices and availability are accurate as of 2019-04-14 23:53:21 UTC and are subject to change. Any price and availability information displayed on http://www.amazon.com/ at the time of purchase will apply to the purchase of this product. Applicable Age: 8-60 months baby. Size: With head circumference of 43cm to 58cm and weight of about 85g. Main Materials: Facing: 98% Cotton; Lining: 98% Cotton Filling. 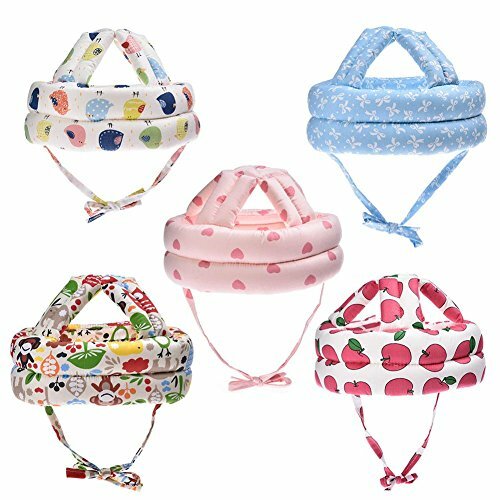 Main Function: With the function of damping and cushioning, it can avoid or damage to the head when the head of infant is collided. Prevent Babies Injured: Baby's heads are very weak,and they are easy to fall down when walking and sitting.Our protective helmet can protect baby's head ,avoid baby injuries. Safe& Comfortable: Our product use high quality cotton fibre and filling with high elastic shock absorption foams,it is good to the touch, nonirritating, colorfast, and odourless. Super Light:The weight of the helmet is only about 90g,not any pressure for baby's heads. Adjustable Straps& Head Circumference : Hat circumference(approx. ): 43-48cm.It will more suitable for babies of different head circumference and it is comfortable to wear. Perfect Protection For 6-60 Months Baby: It is a great tool to help parents protect baby's from fall injury.